Abans is one of the leading air Conditioning solution providers in Sri Lanka offering quality products and services with value added benefits. LG, Abans flagship brand, has won international awards and acclaim for being the best performing and best energy saving air conditioner. 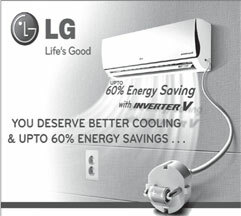 LG Electronics of Korea manufactures air-conditioners using advanced technology, innovative features and design, high norms of quality, eco-friendly features which saves electricity. The innovative BLDC compressor has an in-built magnet that improves power efficiency unlike other AC inverters. It has 13 speed levels for smoother operation and minimises oil circulation with an oil separator system, maximises motor efficiency and minimises compression loss. Some of the value added benefits consumers get when they purchase an air conditioner from Abans are free service campaigns conducted in major towns and cities where Abans mobile service teams conduct service and minor repairs free on-the-spot. All installations and services is carried out by experienced factory trained technicians and engineers. Abans also conducts free seminars for contractors, builders, and hotel owners to educate them on the benefits of selecting proper air-conditioning solutions, and helping and advising them on the best available packages. Abans gives free comprehensive training for school- leavers and young people in air conditioning at the LG AC Academy under foreign qualified trainers. After successful completion of the training course, those who seek employment are absorbed by the Abans Service Department.